Toyota Motor Corp on Thursday lifted its cautious guidance for the financial year to March despite escalating recall troubles that threaten to derail a recovery at the world's biggest automaker. Below is a summary of the main points from Toyota's earnings announcement, as well as a separate briefing by an officer in charge of quality on reports of driver complaints regarding braking in the remodelled Prius hybrid car. * Toyota lifts 2009/10 global sales forecast to 7.18 million vehicles from 7.03 million vehicles. 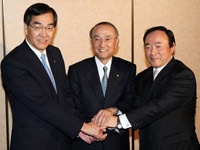 * Expects deeper cost cuts under its Emergency Profitability Improvement efforts, by 340 billion yen ($3.74 billion) to 1.59 trillion yen for 2009/10. * Estimates a sales hit of 100,000 vehicles globally this year from the recalls. This includes an ongoing sales suspension in North America on eight recalled models with gas pedal issues and an anticipated sales hit from reputational damage, Toyota said. Equivalent to 70-80 billion yen. * Estimates another 100 billion yen hit at the operating earnings level this year to set aside reserves for the cost of repairing more than 8 million vehicles for floor mat and pedal issues. * Senior Managing Director Takahiko Ijichi said he was not sure of the estimated impact on 2010/11 earnings from the recalls. * He said any possible fallout from the braking complaints on the new Prius were not accounted for in 2009/10 forecasts. * Toyota will soon notify customers who already own a Prius on how it will deal with the brake mechanism. * Yokoyama: "(The Prius issue) shows that we may have fallen short of the standards expected from us by our customers."